The film is slated to release on 24 August. Ahead of the film’s release, the fun-loving cast of ‘Happy Phirr Bhag Jayegi’ has shared some moments from the sets on social media. Actor Ali Fazal posted a picture of the cast along with their director on his Instagram page. 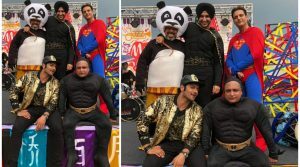 Another adorable behind-the-scenes picture from the sets of Malaysia has Ali Fazal dressed like a rockstar, Jimmy Shergill as Superman, and Jassie gill and Piyush Mishra dressed as batman. Directed by Mudassar Aziz, the sequel to 2016 film ‘Happy Bhag Jayegi’ will star Diana Penty, Ali Fazal, Jimmy Shergill and Sonakshi Sinha.